If you are searching for how to save electricity while using AC still, this guide should help! Here we list the best ways to save electricity while still using your AC unit. There are 9 total ways to save but we page page jumps to the ones we found were the most effective. Installing a Wi-Fi thermostat will allow you to view your AC while away from the home. Most of the time homeowners forget to turn the AC unit back up to 80 degrees before leaving home. They get home and realize the air conditioning unit has been on 76 degrees for over 8 hours. That’s totally wasting electricity and costing you money! A Wi-Fi thermostat will solve that problem for you for pretty cheap ranging for $90-$300. You will get a return on your investment with these bad boys! Wi-Fi thermostats can save you 100’s of dollar per year on wasted cooling. Set alerts through the app so you never forget to turn it off. This is essentially what load controllers do. They make it so your power usage is spread out over the day and night time, reducing your peak energy usage. Most energy companies charge you based off high energy consumption periods. Residential load controllers like the Pensar Load Controller will help you spread out your energy usage to avoid peak demand costs. A load controller can save you 100’s if not 1000’s of dollars off your electricity bill throughout the year. Load controllers usually cost around $3,000-$4,000 for the controller and installation combined. This part is a little bit biased seeing that no other company on the planet sells SRX besides us (Alternative Energy, LLC). Wrapping your ducts with SRX (duct sealing) allows much cooler air to come out of your vents. The main reason your rooms aren’t cooling down fast or all rooms in the home aren’t the same temperature is because your attic is heating up your ducts. Ducts actually account for up to 30% of most residential energy consumption. The further away the room is, the less cool the air will be. SRX solves this problem and keep all your ducts the same temperature no matter how hot your attic is. This will make all the rooms in your home the same temperature. The average cost of duct sealing is around $500-$1,000 and can save you up to 25% off your electricity bill every month. Installing SRX radiant barrier in your attic will keep your home cooler longer, reducing your need for AC usage. SRX can reduce your energy bill up to 50% depending on which package you select. SRX radiant barrier costs around $3,500-$15,000 to install depending on the size of the home but is lifetime guaranteed to save you half your electricity costs over the lifetime of your home. “Yes, we said the world! We hold the ONLY PATENT to a revolutionary radiant barrier alternative product that can save you 20-50% on electricity and when combined with our premium energy products can save you up to 99% on electricity! SRX is lifetime guaranteed and works 3 times better than current radiant barrier technology.” Read More About SRX. Mini Split Systems are basically small air conditioning units that can be installed in each room of your home, removing your need for central air conditioning. Every unit has its own temperature thermostat and can be set to its own settings. This is perfect for families that don’t enjoy the same temperature. A mini split system costs about $1,800 per unit for a good one and can save you anywhere from 20-40% off heating and cooling costs. Keep in mind that you will have to purchase individual units for each room of your home and doing this can get pretty expensive. There’s not a lot of moisture in Arizona so swamp coolers don’t work as efficiently as other areas of the US. With a pre-chiller, the water is pre-cooled before it enters the swamp cooler. Without this the air would come out of the swamp cooler too warm. Pre-cooling the water lets the swamp cooler run like an air conditioning unit. Plus, the swamp cooler costs 25% less than central air conditioning units and can save you anywhere from 20-30%. Use the utility company’s rate structures against them and consume your energy wisely. Choose the proper rate structure from your utility company based on your individual usage and only choose to use your power during the cheapest times of the day. Avoid using major appliances during peak energy times. This costs nothing to do and can save a whole lot of money on your electricity bill every month with just a few simple tweaks to your weekly schedule. Installing tubular skylights removes your need for lighting. Put tubular skylights in your hallways, living room, kitchen or anywhere else in your home. This saves money on electricity by removing your need for lights during the most expensive times of the day. Natural Light says, “Tubular Skylights do not contribute to heat loss or gain, unlike standard framed-in skylights. Installed on any roof surface in under two hours, you will quickly realize the cost benefits of a tubular skylight over incandescent and even traditional skylights. By lighting dark rooms with free, natural light, you can significantly reduce your electric bills”. The best way to find out how much money you can save on electricity while using AC is to receive a free energy audit. Perform a Google search to see if you can find any energy companies in your area that offer free energy audits. 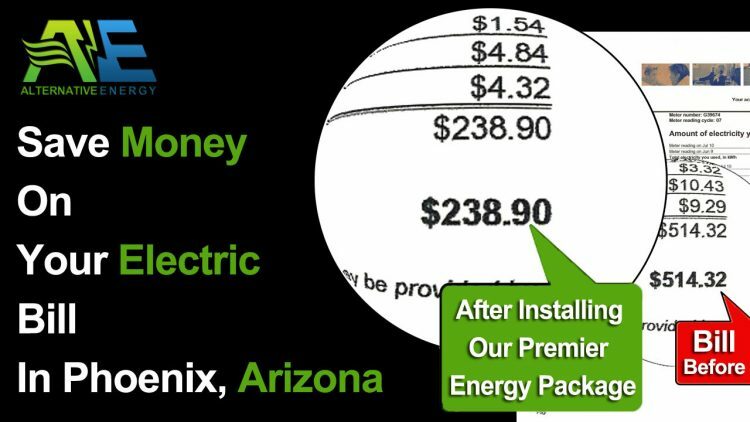 If you live anywhere is the Phoenix Metropolitan Area and would like to receive a free energy audit, click here. Alternative Energy, LLC is offering free energy audits to the entire Phoenix Area including Phoenix, Mesa, Tempe, Scottsdale, Chandler, Gilbert, Fountain Hills, Peoria, Surprise, Sun City, Youngtown, Arizona cities.